I enjoy getting a fresh batch of eggs each day from our little flock of hens. We celebrate both Passover and Easter, so the recipes I’m sharing here are timely. Eggs really are nature’s perfect food! Eggs don’t contain as much cholesterol as once thought, and they have a huge amount of protein in the whites, plus the whole egg really is the perfect food. Eggs contain antioxidants, vitamins, calcium, iron, phosphorus for your bones, zinc for wound healing and infection and most of the minerals required for health. And the breed of the hen determines the color of the eggs, so brown and white eggs are nutritionally the same. Cover with a couple inches of cold water, cover, bring to a boil, turn off heat and let sit 12 minutes. The breed of the hen determines the color of the egg. 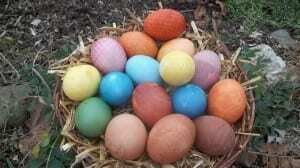 Colored eggs are one of the most fun things at Easter and coloring them naturally is fun. We use onion skins which turns the eggs light amber to dark orange to brick red, beet juice for pink eggs, the spice turmeric for brilliant yellow and red cabbage which turns the eggs a beautiful teal blue. I love to do this with the little ones since they learn lessons in food chemistry and also learn to be good stewards of their environment by recycling items which might be pitched into the garbage into making things of beauty. Now there’s no real recipe, but here’s how I do it, the same way my Mom, Mary Nader, and her Mom did it. In a saucepan, place as many papery outer skins of yellow and/or red onions that you have. Cover with an inch of water. Bring to a boil, lower to a simmer and cook until onion skins have colored the water, anywhere from 10-30 minutes. Use this same method for red cabbage (just chunk it up), beets, spinach, etc. Strain and add 1 tablespoon or so of clear vinegar to every cup of liquid. This sets the dye. Don’t worry about adding too much vinegar. A little more won’t hurt. To make turmeric colored eggs, place two tablespoons of turmeric in 1-1/2 cups water. Stir and place in pan. Cook until it starts to boil. Remove, let cool but don’t strain. Add a teaspoon or so of vinegar. 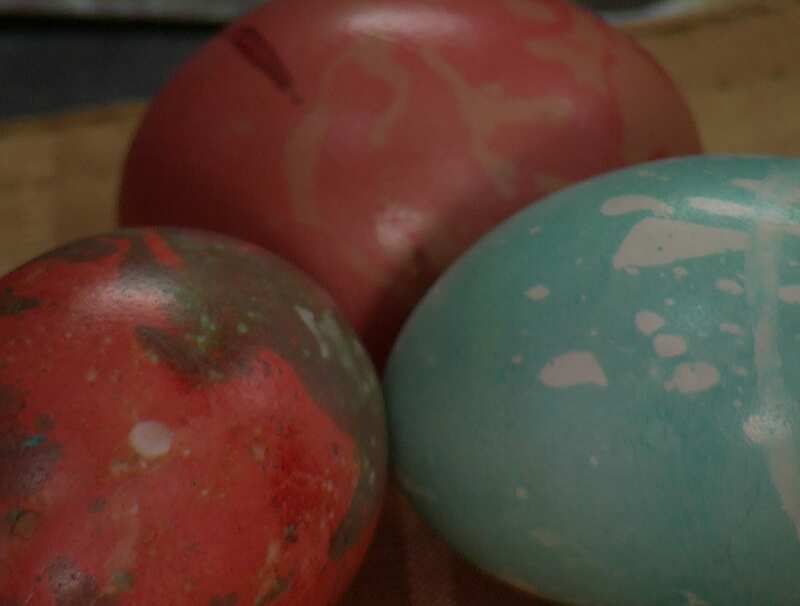 Place eggs in dye, stirring to coat. When you remove the eggs, gently wipe off the turmeric with a soft cloth or run them very quickly under running water. Now put your boiled eggs in. Depending upon how long they sit in the dye (and know that it takes a lot longer than commercial colors), the eggs made with yellow onion skins will be pale yellow to dark amber. Red onion skins produce eggs that are brick/brown red. Red cabbage is the winner: it makes beautiful teal blue eggs! Turmeric makes the eggs more brilliantly yellow than the marigolds my dad used to plant in our tiny front lawn. If you want, you can put the eggs in the dye overnight in the frig. To make a basket weave pattern on eggs: Wrap a piece of the open weave plastic bag that onions come in securely around the egg. Secure with a twist tie. Drop in dye. Let egg dry before removing wrap. Cover with cold water, bring them to a nice boil, put the lid on, turn the fire off and let them sit 12-15 minutes. They turn out perfectly cooked. To remove the shell, pour the whole pan of eggs into the sink, drain and add cold water. I peel them under the water and that works well. Either cook in the crockpot, on top of the stove, or roast in oven. Delicious made a day ahead and reheated. Put everything in crockpot and cook on low 6-9 hours (high 3-4) or until tender. Or bake covered, in preheated 300 degree oven for about one hour per pound or until done. To cook on the stovetop, cook on low again until done. Check after 2 hours. Remove bay leaves. The symbolics of eggs…rebirth, salvation etc, and resurection in the Orthodox traditions. Thanks! I’m glad to know that.